JLC - Jaeger Lecoultre Tribute to Geophysic: Platinum, Steel, or Rose Gold? Which one is your favorite? 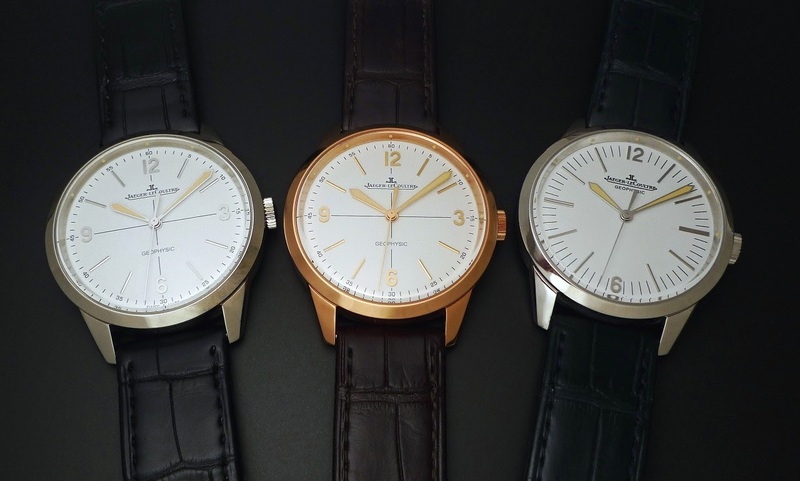 Jaeger Lecoultre Tribute to Geophysic: Platinum, Steel, or Rose Gold? Which one is your favorite? Here is the picture I took at the manufacture during the unveiling of the Tribute To Geophysic. From left to right: Steel, Rose Gold and Platinum. I like this watch a lot, for what it is, a very cool watch. I have hard time choosing one them. I would say steel, but platinum is the evident choice. Rose gold is a tempting outsider, too. Rose gold. The size is perfect for this metal. Also the lume colour is better suited to the rose gold version, imho. That‘s why i chose the rose gold version. The only rose gold watch in my collection. I think the yellow lume on the hands looks a little awkward against the white metals, but fits in beautifully on the rose. Steel with the Pt dial. All pieces are beautiful... of course! Best regards! JLC should bring back the steel model as a regular production piece on a bracelet with a black dial, and fill in the indices with lume. It would KILL as a Milgauss competitor, IMO. I am pulling towards the simplicity of the platinum dial. Steel with the 3/9 and geophysic markings, Or the pt with the crosshair. But I own the steel, since I couldn’t get a hold of the pt one. But the original 1958 could be an option😉. goes well with the golden hues on the dial & numerals.